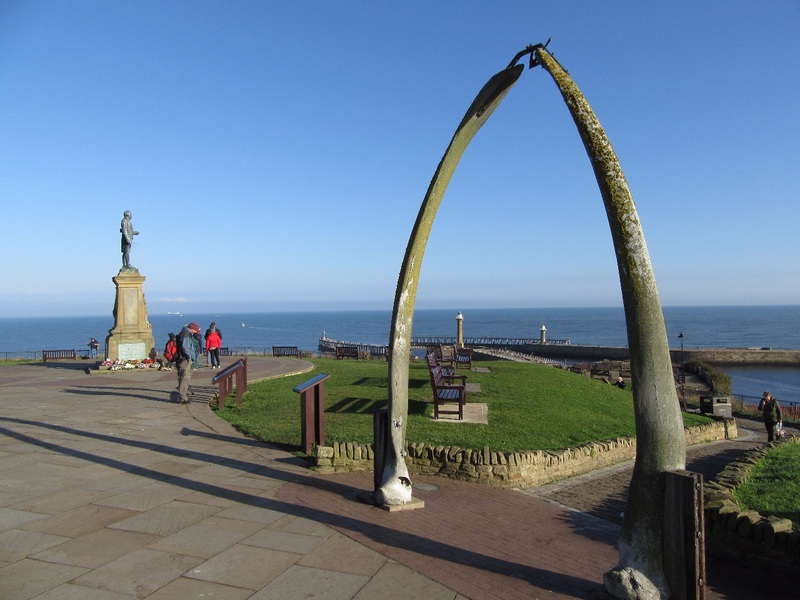 The Whalebones, and statue of Captain Cook on Whitby's West Cliff, where Whitby Astronomical Society often hold Public Observing Nights, for the benefit of Whitby people, and visitors. Founded in 1994 following a Night class course in astronomy by Rosemary Bowman, the initial group of 9 became a fully fledged society by 1996 with 14 members. Mark Dawson became chairman, Rosemary, treasurer and Andy Lawrence and Geoff Wilson, liaison and events co-ordinators. The society meets from October to May at Whitby College (now called Caedmon college- Normanby campus) on the first Tuesday of the month ( 2nd if college holidays interfere) from 7:30pm room H1 main block. The society also has use of the Bruce observatory at the college, which houses a F15 - 5 inch Cooke refractor dating from the late 19th century. The scope still has a functioning weighted drive mechanism. From mid October to mid April any reasonably clear Sunday evening is public and members open night at this facility. Winter times –from 7pm; Spring 8pm and then 9pm. The society hosts numerous star party events throughout the year, especially during the summer months when conditions and objects allow. 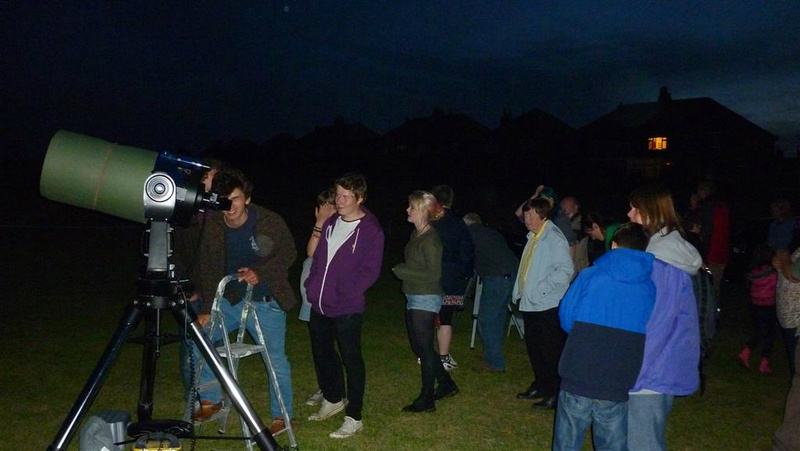 Indeed we pride ourselves on public star parties, hosting as many as 20-30 each year. 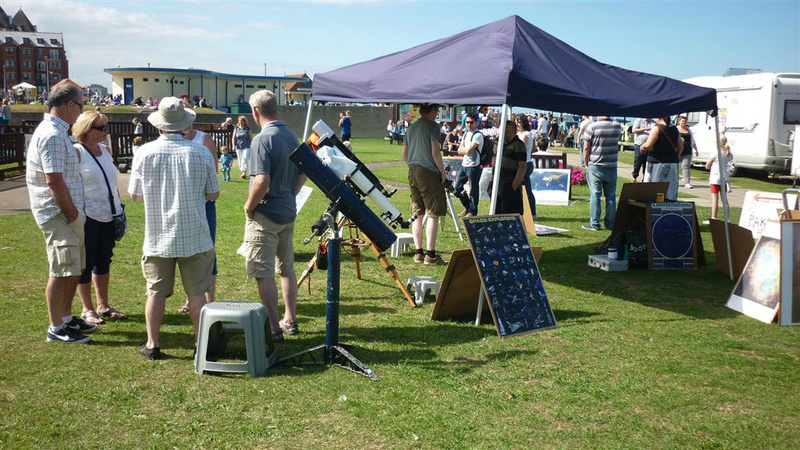 The society also supports the Whitby Regatta festival, hosting both solar and evening star parties. Many of the summer events are held on the west cliff –Whitby near Cpt Cook’s statue. Times vary according to time of year. Outreach events take us to Hook’s House Farm – Robin Hoods Bay, Westerdale, Fylinghall, Castleton and Danby and sometimes further afield. 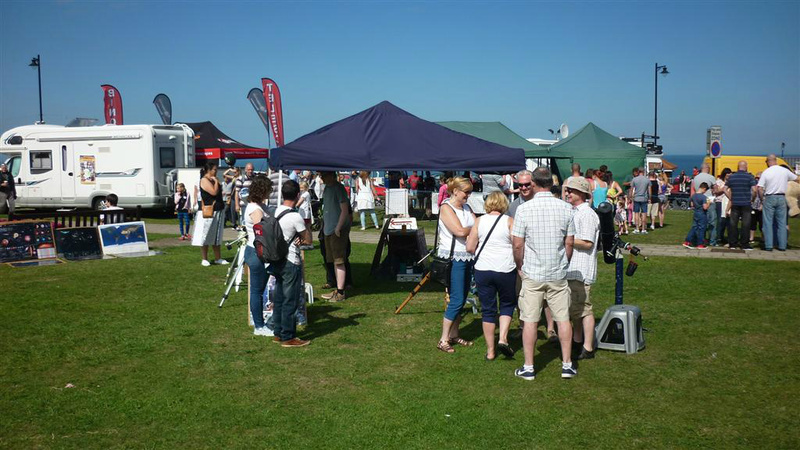 We have been fortunate to benefit from two successful lottery awards –allowing us to purchase a Meade LX200 12inch scope, Laptop, screen, LCD projector, generator and gazebo etc, all of which have been most useful over the years. 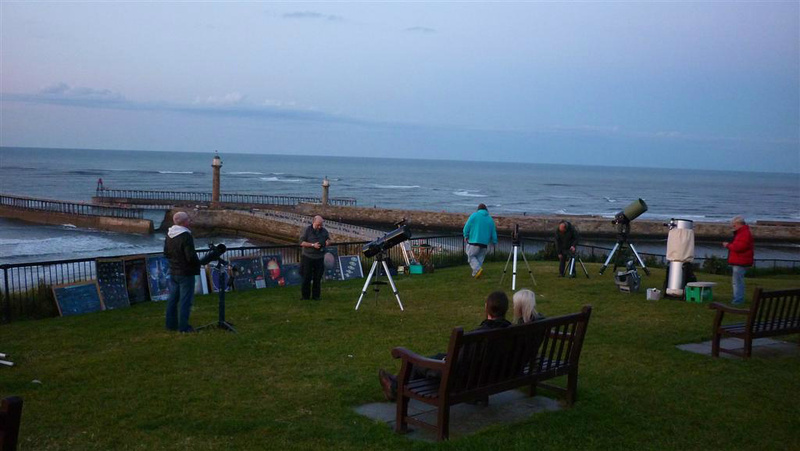 Thanks Mark, Rosemary and the Whitby Astronomers for this contribution. 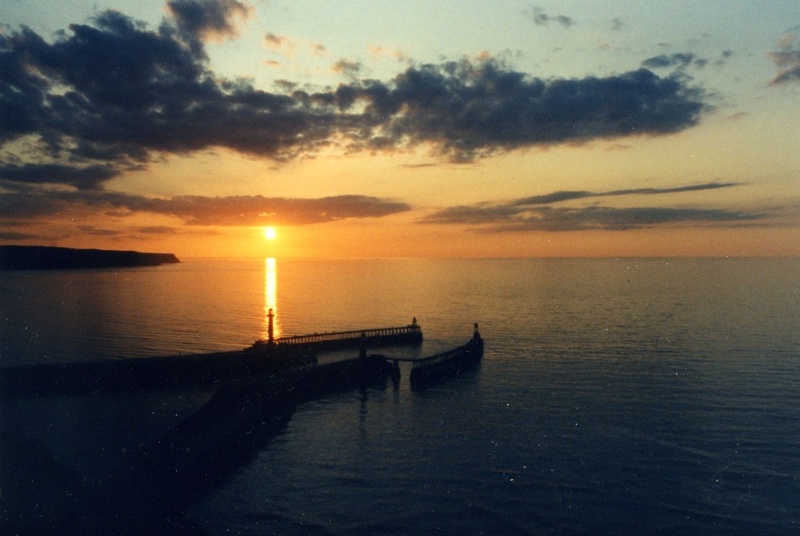 WHITBY SUNSET over the North Sea, at around the time of the Summer Solstice. The town is now within the exended Borough of Scarborough. Historically, Whitby is associated with Captain James Cook, who sailed the HMB Endeavour to Tahiti so that observations of the 1769 transit of Venus could be observed, and recorded. Whitby also served as part of the inspiration of Bram Stoker when writing his novel 'Dracula', and, today as a result of this connection, there are 'Gothic' gatherings held in the town twice a year! these are usually around 'Beltane', at the beginning of May, and 'Samhain', around Hallowe'en.